The most polluted cities in Russia have been ranked by RIA Rating. Norilsk, Moscow and St. Petersburg top the list of the most polluted cities in Russia, according to ratings by RIA News. At the same time, Mercer consulting agency has identified Dzerzhinsk as the most contaminated city in Russia. The level of pollution in Russian cities was determined based on data from the Russian State Statistics Service (Rosstat), taking into account emissions of airborne pollutants from stationary sources and from vehicles. "Norilsk retains its ranking as the largest emitter of pollutants in Russia. And the emissions from that city, with a population of just around 200,000, are more than twice the emissions from Moscow, which has millions of inhabitants — 1.96 million tons versus 0.99 million tons per year. 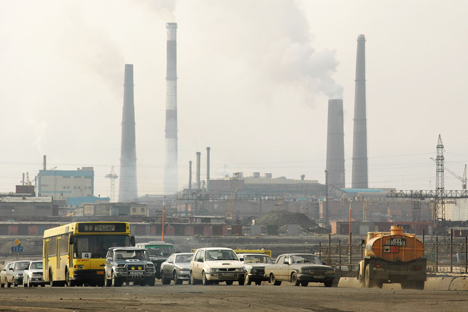 What's more, Norilsk's rating is significant in that its emissions are predominantly industrial, and the percentage of vehicle emissions is only 0.5 percent. For second-place Moscow, the picture is completely opposite — there, vehicles accounted for 92.8 percent of the emissions. In third place is St. Petersburg, also crowded with cars that accounted for 85.9 percent of the emissions," according to experts at RIA Novosti. The top 10 cities with the most polluted air were mainly places where steel factories, oil refineries, or chemical factories are located. "In almost all of these cities, the pollution is predominantly from industrial sources. Of the first 20 cities, almost half have populations over one million," according to the ratings materials. At the same time, experts note that, in recent years, the situation has improved and emissions have been reduced in most of the cities. RIA Rating estimates that 56 cities have reduced their emissions over the past two years and emissions have increased in only 36. The 10 most polluted cities in Russia are the following (starting with the worst): Norilsk, Moscow, St. Petersburg, Cherepovets, Asbest, Lipetsk, Novokuznetsk, Omsk, Angarsk and Magnitogorsk. It is worth noting that three Russian cities (Norilsk, Dzerzhinsk and Rudnaya Pristan) made the list of the 10 most environmentally polluted cities in the world, according to Mercer consulting firm. Russia's Komi, Magnitogorsk, Karachai, Volgograd and Kola Peninsula were named the most environmentally hazardous areas. One of the main criteria in evaluating contaminated sites was their proximity to large urban centers. Heavy metals are recognized as the main source of pollution, and Mercer research shows that more than 1 billion people in the world are negatively affected by environmental pollution. Most of the cities listed in the top 10 dirtiest cities are places where coal, or metals such as lead, is mined. The same analytical company identified the cleanest cities in the world. Last year, they were Calgary, Honolulu and Ottawa. Experts examined 221 metropolises in their study. The key considerations in determining the cities with the most favorable ecosystem were water availability and purity, quality of garbage removal, the condition of the sewage system, air pollution level and transportation problems. The cities on the list for best environment all use renewable sources of energy. In addition, they regularly take measures to reduce levels of air and water pollution. Another factor is the noise level in the cities. Last year, researchers from Yale and Columbia universities identified the most ecological economies in the world. On this list, Russia ranked 106 out of 132 countries. Scientists noted that Russia had negative tendencies in almost all of the indicators, except for sulfur dioxide emissions. Based on materilas from RIA Novosti and RBK.